Stewardship is the act of using our Time, Talent, and Treasure to show our gratitude for the gifts God gives us. We are able to share them with our community and enrich our relationship with God. 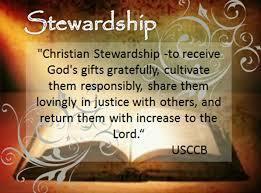 Stewardship requires all of us to examine the gifts God gives to us. He is a loving and generous God. We are the hands of God in our lives and we can create love with our Stewardship. Consider what you have to offer to St. Mary Star of the Sea. Why not add a plaque to our Memorial Wall for someone who has died? This can be a member of your own family or as a gift for someone else. For a donation of $200.00, you can put a 2"x4" name plaque on the wall. A Mass is dedicated on the first weekend of every month to those whose plaques are on the Wall. Donations are needed on a continual basis to help those in need. Please give what you can. Contact the Parish Office to find out what items are in need or to make a monetary donation. Over the years, many parishioners have taken a personal interest in enhancing the beauty of the church. 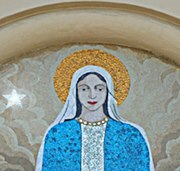 The Madonna Mosaic, which is installed just above our church's front doors was created and donated by Mrs. Bella Beauregard in the early 1960's. The mosaic was hand created using 22,617 pieces of tiles imported from Norway, Denmark, and Italy. In the early 1980's the Sanctuary Furniture was custom-made for St. Mary's and donated by Jens and Agnes Matthiesen. These items include the Altar of Sacrifice, the Ambo, the Celebrant's Chair, and the former Baptismal Font. The Stained Glass Windows in the doors between the vestibule and the nave of the church were handcrafted and donated by Jens Matthiesen. Many special pieces of furniture have been handcrafted by Robert Trost. We ask you to bless all members of our parish. We thank you for all the gifts you bestow on each and every one of us. We pray for the grace to share those gifts, and for all who attend Mass at St. Mary’s to be as generous as they can be in their financial support of our church. We ask this through Christ our Lord. There are many ways to make your weekly donation. Just as your household needs to have income to meet regular expenses, so does the Parish. Some parishioners can afford to give more than others. The amount you give is up to you, but we believe everyone can contribute something – and all contributions, whatever the amount, are valued. Choose the option that is best for you. Enclose CASH or CHECK in your Weekly Support Envelope or use the blue pew envelopes if you’ve forgotten your envelope at home. A loose check in the plate is acceptable as well. AUTOMATIC BILL PAY from your bank: You establish St. Mary’s as a monthly bill and your bank sends the church a check each month/week as authorized by you. Very easy. You have complete control of making changes at a moment’s notice. ACH: You authorize regularly scheduled payments to be deducted from your checking or savings account. Then, just sit back and relax. Your donation will be deducted automatically on the specified day. And proof of payment will appear on your bank statement. The authority you give will remain in effect until you notify us to change or terminate the authorization. ACH is dependable, flexible, and convenient. To take advantage of this service, click here. Complete the authorization form and return it to the Parish Office or place in the weekly offertory collection at Mass. Remember to attach a voided check. CREDIT CARD: You authorize regularly scheduled payments to be charged to your Visa or MasterCard. The authorization will remain in effect until you notify us to change or terminate it. To take advantage of this service, click here. You can confidently contribute to St. Mary Star of the Sea with EFT. It is easy, secure and a great way to remember your contributions of Treasure. Pray about this, and remember: God is never outdone in generosity.